Every great journey needs a service station – so in our new series we’ll be covering some of the country’s best, worst and most unusual motorway amenities based on the 1000s of Google reviews. Watford Gap Services is a stalwart of the service station industry, famously straddling the supposed north-south divide as motorists pass through Northamptonshire on the M1. The country’s oldest service station opened its doors on 2nd November 1959, coinciding with the first trickle of traffic down the lanes of the freshly-minted M1 motorway. Here’s what Watford Gap Services looked like in 1961; you can just about see it on the right there – an unobtrusive building designed by Harry Weedon, the architect for Odeon Cinemas. Over the course of the last 56 years, Watford Gap Services has entered the cultural lexicon as perhaps the most frequently-cited name in roadside respite – notorious during its early days operated by the once-renowned Blue Boar, and still widely-known under current owners Roadchef. In its time as a Blue Boar establishment, it became an infamous overnight stop-off point during the 1960s for myriad rock and roll hall of famers travelling the length of the country for gigs. 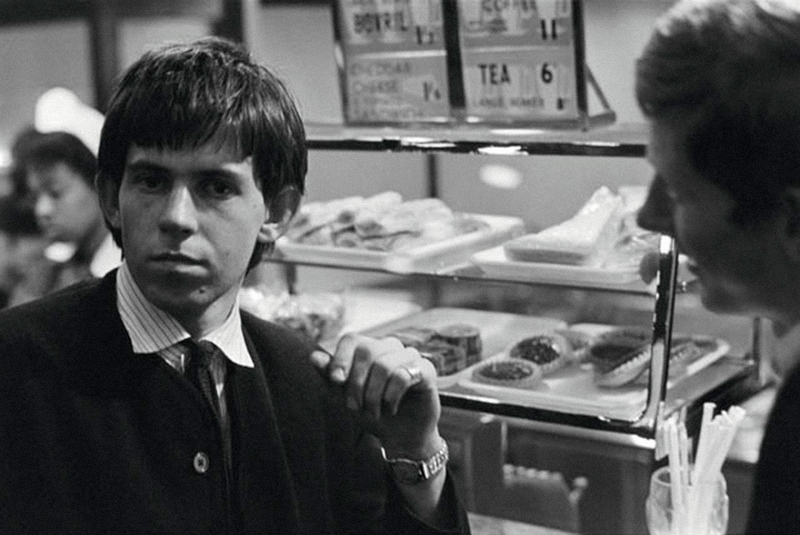 The Beatles would stop in on regular trips between London and Liverpool, as would Pink Floyd and the Rolling Stones (here’s a photo of Keith Richards standing next to an assortment of Watford Gap pastries back in 1963). Bands were talking about the place so much that Jimi Hendrix mistakenly formed a second-hand impression that the Blue Boar was a London nightclub. Not all musicians spoke warmly of Watford Gap Services, however. In 1977 – after a decline in quality as a result of the recession and low-end food at high-end prices – folk singer Roy Harper penned a scathing ode directed at (and named after) this particular stop-off point. The great plastic spectacular descendant of Stonehenge”, Roy’s song is an incendiary diss track that in many ways was a pre-internet precursor to today’s furious Google and Tripadvisor reviews – albeit more eloquent than most. The track became a subject of minor controversy and record label wrangling due to an EMI board member also sitting on the Watford Gap’s board of directors – who then banned Watford Gap (for a time) from subsequent releases of Roy Harper’s Bullinamingvase album. Today, what was once a single, modest structure has blossomed into a plethora of buildings spanning the southbound and northbound sides of the M1, connected by a footbridge offering a (low-flying) bird’s-eye view of vehicles passing underneath. Replacing the once-lacklustre catering building, there is now a McDonalds, a Costa Coffee and a WH Smiths – alongside the usual smattering of claw cranes and slot machines. There is also a coin-operated Peppa Pig video ride for the youngsters (and the young at heart). All in all, it’s a far cry from the dark days of the 70s, even if not everyone is entirely won over yet. Regardless, after more than half a century as a pillar of the motorway amenities industry, Watford Gap Services is finally receiving the recognition it deserves. For its 50th anniversary in 2009, Roadchef celebrated by installing a signpost marking the imaginary north-south divide, and by buying a former employee’s autograph book (featuring entries from Paul McCartney, Mick Jagger, Keith Richards, Brian Jones, Dusty Springfield and Cliff Richard) for £1000 and returning it to the site of its inception. But perhaps the most spectacular tribute came from filmmaker and composer Ben Tillman, who wrote and directed a heartfelt, 10-minute musical opus for BBC Northampton, recounting the history of Watford Gap as sung by eighty people who had worked at, passed through, or been present at the opening of the services.